We've already seen what happens when you fall asleep and wake up with no short term memory (Memento) and what happens when you avoid sleep at all costs (The Machinist) and now with Shuffle, writer/director Kurt Kuenne explores a character who wakes up at a different point in his life with all of the memories from his other ages. What's worse is that he doesn't know how this happened, why or how to break the cycle. We first meet Lovell Milo in his 30s explaining his bizarre life situation to a doctor. He can't figure out when the time jumps started, why they started or how to stop them but he does know that falling asleep is a curse and so he's unsuccessfully trying to stay awake. During one of his waking moments, he encounters a little girl who tells him to pay attention because he's looking for answers though to what question(s) remains a mystery. He eventually does uncover the defining moment which changed his life trajectory which then leads to his discovery of why he's jumping all over time and how to stop it but this is only part of Lovell's adventure. The nature of Kuenne's story doesn't allow for a quick synopsis and quite frankly, Shuffle is best experienced with little prior knowledge of the plot details. The script is complicated and the first few time jumps are disorienting for the audience, more so than they are for Lovell since we don't even know who he is, but Kuenne is confident in his story telling abilities and it shows. With each jump we learn more about Lovell and his family and the fragments of a story start to emerge and though Kuenne throws in a few red herrings, he never loses sight of his story or the audience; it all looks and sounds complicated but it's never so complicated that we can't follow. The time shifts become less disorienting the more they occur but at the same time, the mystery also grows. It's a fascinating and exceptionally well executed story which pulls the audience along and just when you think you have the answer, Kuenne adds another layer to the story. With his documentary Dear Zachary: A Letter to a Son About His Father, Kuenne displayed an excellent sense of editing and storytelling, building a hugely compelling tale and he continues his efforts here with great success. What's particularly interesting about Shuffle is that the third act feels very different from the film's first hour; it doesn't only change tonally but the style of the storytelling shifts as well and yet the movie doesn't feel like a sell out. There's a tale of redemption and intense emotional depth in Shuffle and though some filmmakers would lose their audience with the reveal, in Kuenne's hands it's not only appropriate but also satisfying. Though it starts as a thriller, Shuffle has a lot more to offer than a boiled down plot synopsis or trailer suggest. T.J. Thyne delivers an excellent performance as Lovell, the time traveller, riding an emotional rollercoaster that sometimes feels more like a death drop, the film looks great with it's retro B&W aesthetic, the aging effects are subtle and the music, also composed by Kuenne, is haunting. 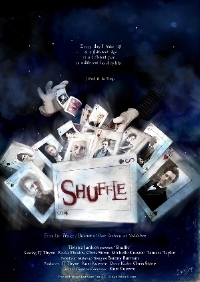 Shuffle is a huge surprise, a clever movie that trumps preconception to deliver a heart warming story of self discovery. Shuffle is available on DVD and VOD today. DVD Extras: Feature commentary, Behind the scenes interviews and deleted scenes with commentary.